We designed the Barista Brain to regulate brew time, water temperature and volume, the three variables that can make or break a pot of coffee. Simply add water and ground coffee and select the number of cups to brew -- the machine will handle the rest, giving you perfect coffee every time. A delicious cup of coffee is art and science combined: the art of extracting rich flavors and aromas from coffee grounds, and the science of time and temperature colliding in just the right way, at just the right moment. 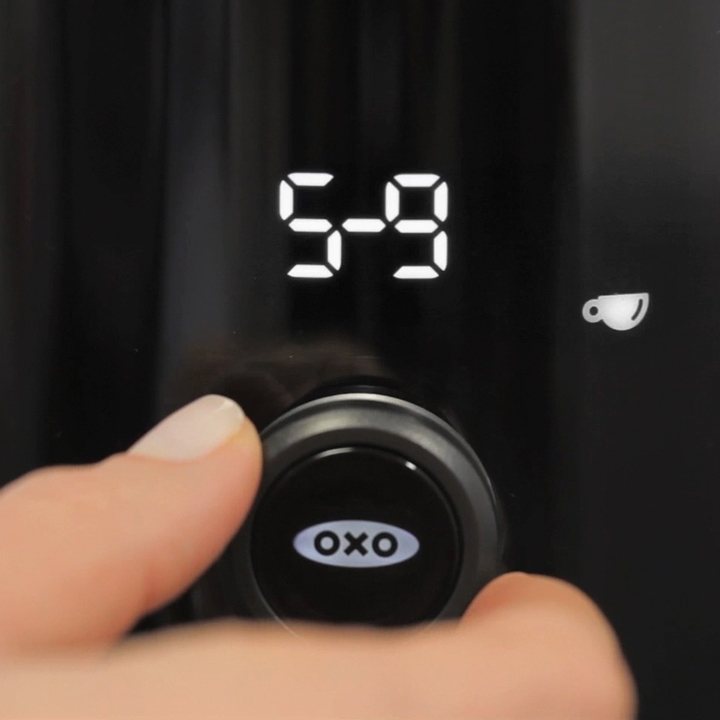 The OXO On 9-Cup Coffee Maker heats water to the optimal temperature to help your favorite roast reach its full potential, and precisely maintains the temperature throughout the entire brewing process. Water is pumped to the brew basket in perfectly timed cycles, starting with a short cycle that allows coffee to bloom for full flavor extraction. The intelligent microprocessor monitors time and temperature from start to finish, ensuring the precision of hand-crafted coffee with the ease of ordering at your favorite local coffee shop. You choose the number of cups and we’ll do the rest, creating a pot of perfection every time. The Experts Agree The Specialty Coffee Association of America (SCAA) is a non-profit trade organization and world-recognized leader in coffee knowledge development. The organization sets and maintains the quality standards for the industry. The SCAA only certifies home brewers that meet their rigorous technical requirements. The OXO On 9-Cup Coffee Maker has been recognized as an exemplary home brewer by the SCAA for meeting their water temperature, brew time and overall quality standards. Intuitive LED Interface The backlit screen displays the Coffee Maker status and freshness indicator. A single dial allows you to program the number of cups you'd like to brew. You can select between two settings: 2-4 cups or 5-9 cups. 2-4 cups can be used to brew a single serving of delicious coffee, while 5-9 cups is perfect for sharing. In either case, the machine will automatically adjust the brew time to account for the amount of coffee you want to brew. Precise Control of Water Temperature & Volume Water is heated and held throughout the brew cycle at the perfect temperature for coffee (197.6-204.8°F). Once it is brought up to temperature, the water is pumped to the brew basket in perfectly timed cycles, starting with a short cycle that allows coffee to bloom for full flavor extraction. Intelligent Microprocessor The Coffee Maker's internal microprocessor monitors all operations and controls for the 3 things that can make or break a cup of coffee -- brew time, water temperature and water volume -- to achieve consistently perfect results. Rainmaker Showerhead Water is evenly dispersed over the coffee grounds for uniform saturation and full flavor extraction. Cone Shaped Brew Basket The basket shape ensures that the grounds bed is sized for full flavor extraction whether you're making 2 or 9 cups of coffee. Internal Mixing Tube Coffee is blended thoroughly as it is brewed into the carafe, so the last sip is as delicious as the first. Dimensions(WxHxD)in. 8.30" x 17.2" x 15"